I was reading over Del's blog and she inspired me to christen this blog with a Meme. I'm tagging any knitting blogger who reads this to post one too and add anything else that you've done or want to do! I've bolded the ones I've already accomplished. Happy knitting. What's new is that I've been doing a little knitting, a little spinning and a little sewing. 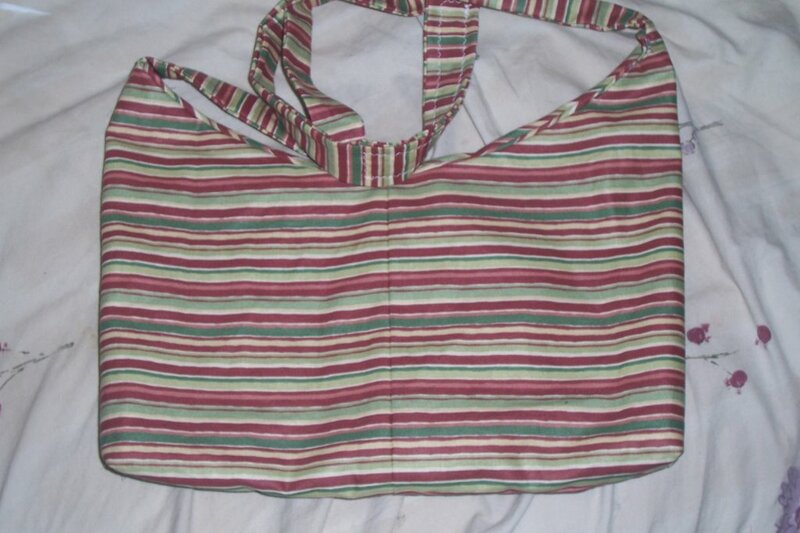 I like sewing bags, to me they don't seem as overwhelming as making wearable garments. I don't think I'm ready for that stage yet. 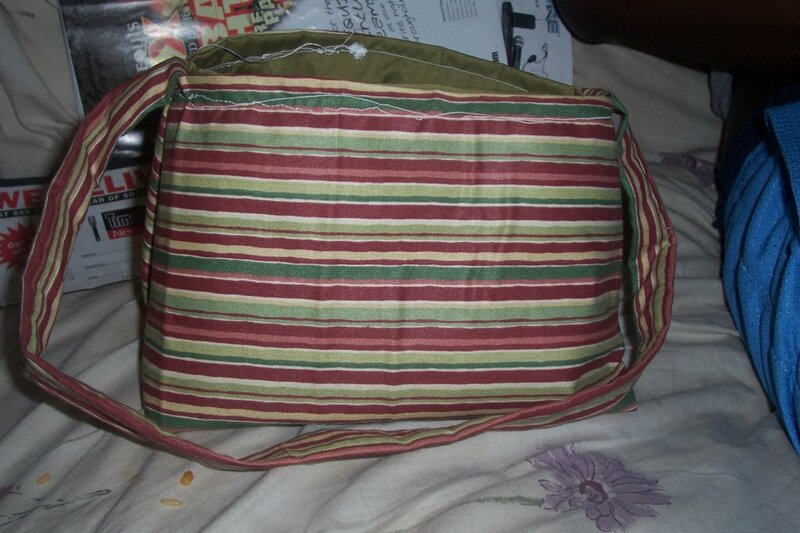 Here is a Jordy bag I made. The tutorial was pretty easy to follow except it was a mutha matching up the stripes down the middle. Overall, I really like the way it came out. 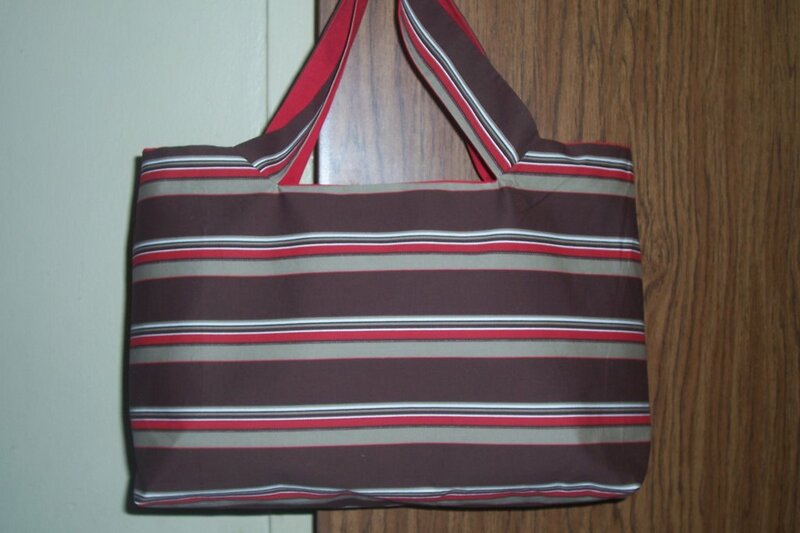 My latest sewing project is a bag I found here on crafster. I fell in love with her bag and had to make one of my own. I made one yesterday afternoon and fell in love with it. 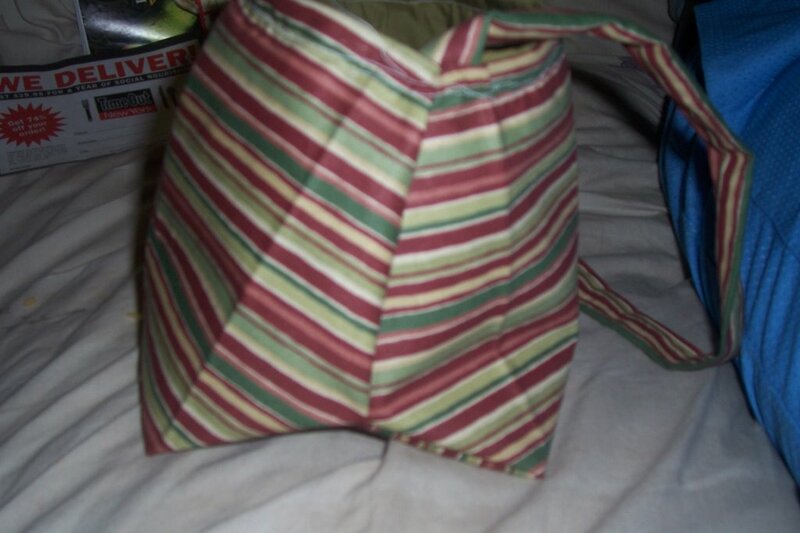 I wanted to put a pocket in it but somehow the fabric rectangles I cut suddenly disappeared. Of course I found it after the bag was completed. It was stuck under the ironing board, go figure. 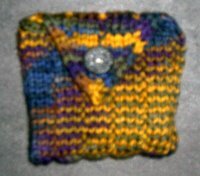 This is going to co-worker of mine for her birthday but I am definately making one of these as a knitting project bag. 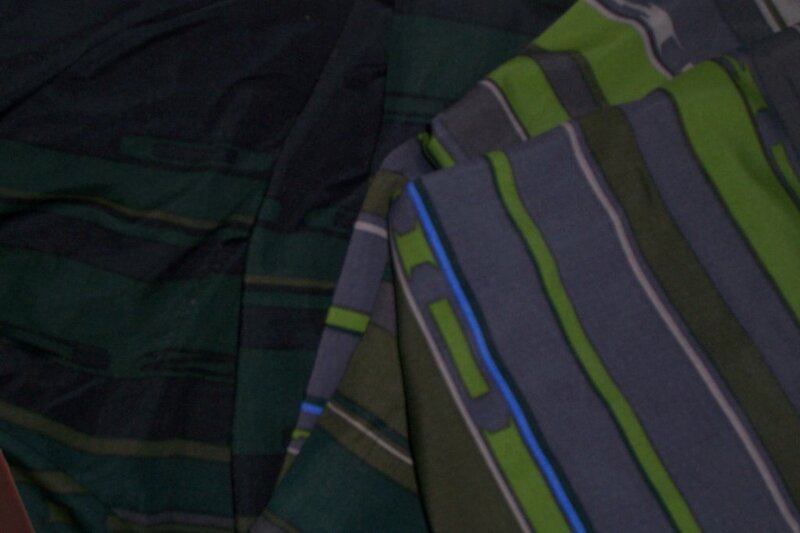 The only problem is choosing what fabric I want to use. Both of these skeins are less than 40 yards. 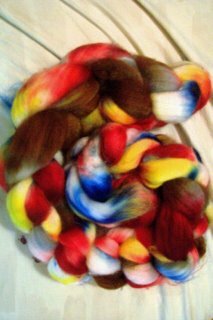 The one on the left is some black and white roving I got from Necia that I dyed blue and red. It is soooooooo soft. I wish you could pet it as much as I do. The one on the right is spun from the roving pictured in my previous post that I dyed. This picture doesn't do the colors any justice. I like how they both came out but the only thing I can make with them is some more wrist warmers or maybe a small hat. I guess my wrist will be very warm this winter. I've really been slacking in the knitting department. I wanted my next sock project to be a challenge so I'm knitting Baudelaire from the new knitty. I picked the wrong yarn but you know what, I'm not froggin and that's that. I think the stripes mess with the lace pattern but I like the yarn. It's Lorna's Laces in a purple stripe color that I picked up a while ago from Knitty City (hey Sahara). I can't wait to see how the reverse heel flap works out. 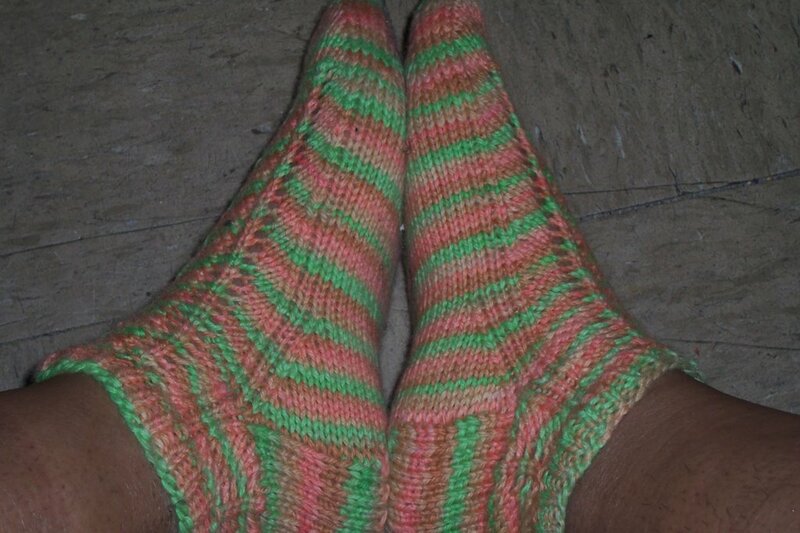 Did I mentioned that I finished those other socks that I was working on? Anyway, here they are. I'm pleased but I think they're a little too warm for the summer. In other news, as many of you know Sahara and I are hosting a Sistah Friend Barbecue in Harlem on August 5th. I will be sending out directions to the park soon. All are encouraged to bring something. I'm going this weekdend to check out the park and see if there are tables available. If not, then you guys will have to bring your own lawn chairs or blankets. I'll let you know by Sunday the latest. 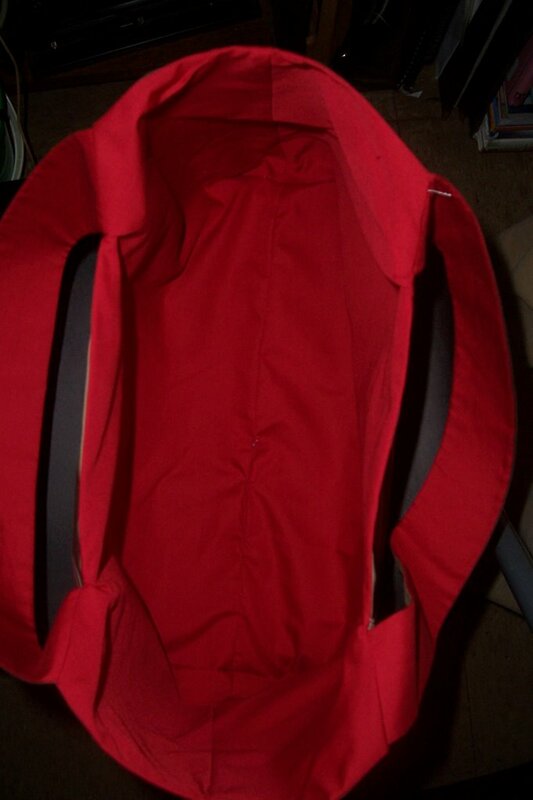 I'm going to post a list in my sidebar of things we need you guys to bring. Please email me and let me know what your bringing so I can cross it off the list. I'm really excited about this event and hopefully we can make this the first of many more. 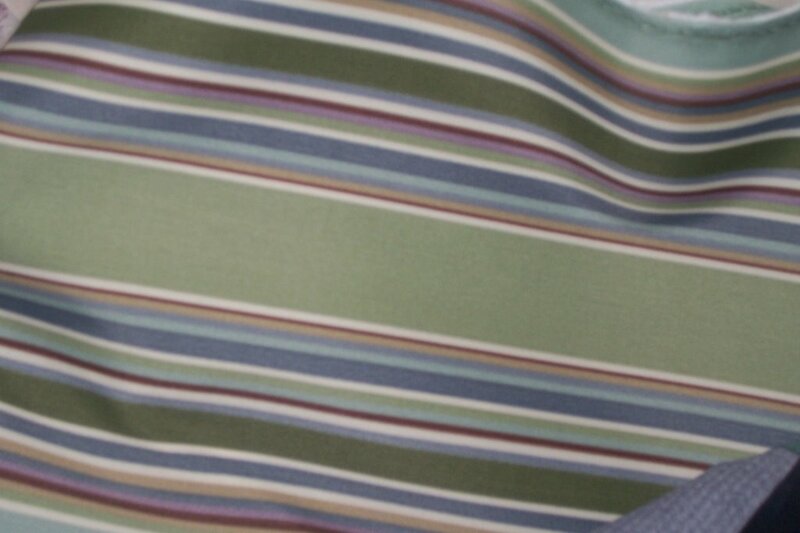 I also got 2 yds of this online for a pretty good price. I guess I got a thing for stripes huh? Please don't ask me what I'm going to make with all that fabric. I like to think of myself as an intuitive knitter so maybe some of that chi will flow onto my sewing. I'd like to thank the MTA for Mondays train delay.It took me twice as long to get to work so I had plenty of time to work on these anklets. Toe city, here I come! This is a toddler poncho pattern that I'm working on. I'm going to put a rose near the upper right side. I can't decide on what border to do. I know I want to do something like a panel, but what kind? I'm thinking Chocolate intarsia roses on a Rose background, A whole Rose background with Embossed flowers or leaves, Intarsia using that scottish dog pattern or argyle, cables will also be in for the fall.....If only there were enough minutes in the day to create all the crazy ideas that are cooped up in my mind. A lot's been going on over in the spinville. I'm not going to tell you who gave me the ravishing Merino/Tencel blend roving that I'm spinning up on Moe. I think I may have finally got my spinners card because I nearly had a corinary spinning it up. It threatened to split up on me a couple of times but the process was fairly smooth. Here's a close up of the roving, I tried reeeeally hard not to overspin it. Remember my first try at dying roving? Well, here's what happened. 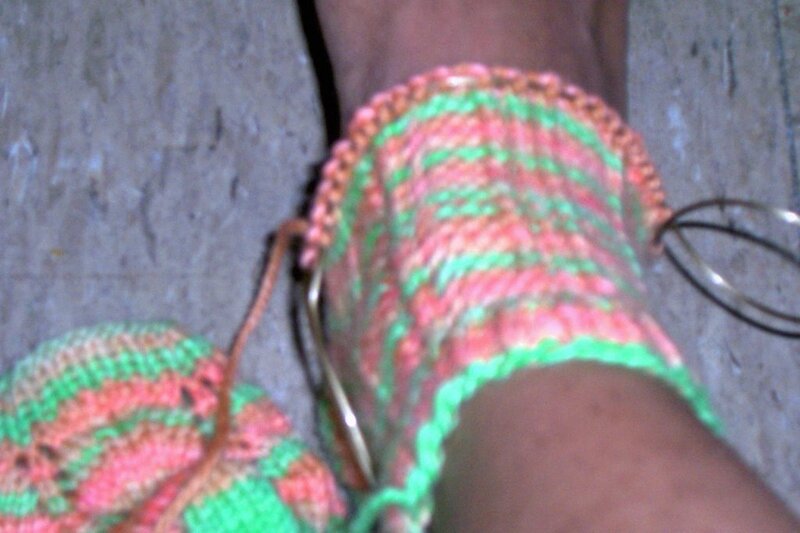 Wrist warmers (If I could ever start the other one). Now I done forgot how many stitches I casted on for the first one. Hopefully I wrote it down in my notebook. If I didn't, then I may have to guess, or try and count the stitches around. I pray for mercy from the gauge monsters. I dyed this up two days ago. I've been dying to spin it but Moe only came in the mail today. You don't know how hard it was trying not to spin it last night. Is it wrong to pet your roving every time you pass it sitting in your spinning basket? I didn't think so. Remember the colorful roving I pictured in my last post? 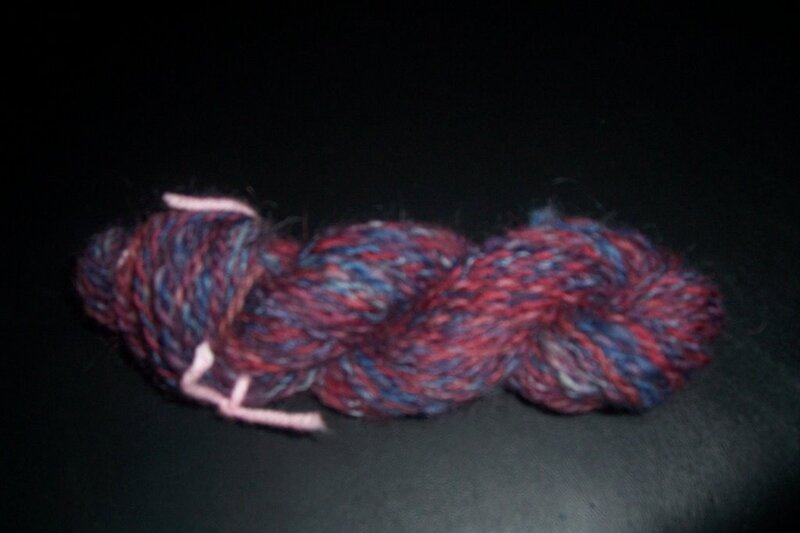 Well here is 47yds of it, spun on Miney. This picture doesn't show the true color, but it's close. It seems to me like maybe a worsted weight yarn? Who knows? If you didn't think I was busy enough, here's proof that I can't keep my hands still for one hot second. I made these stitch markeres the other day, somewhere in between dinner and going to bed. 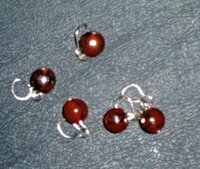 Why, because I was very curious as to what all the hub bub was about dangling stitch markers. I'll let you know how they are once I test them out. Harry B.F. Leicester: Oh, Marie! Marie-Adda Lidalam: Yes Harry, what is it? Harry: I'm in such a bind and I don't know what to do! Marie: Oh Harry, just tell me what it is. You know I'm here for you. 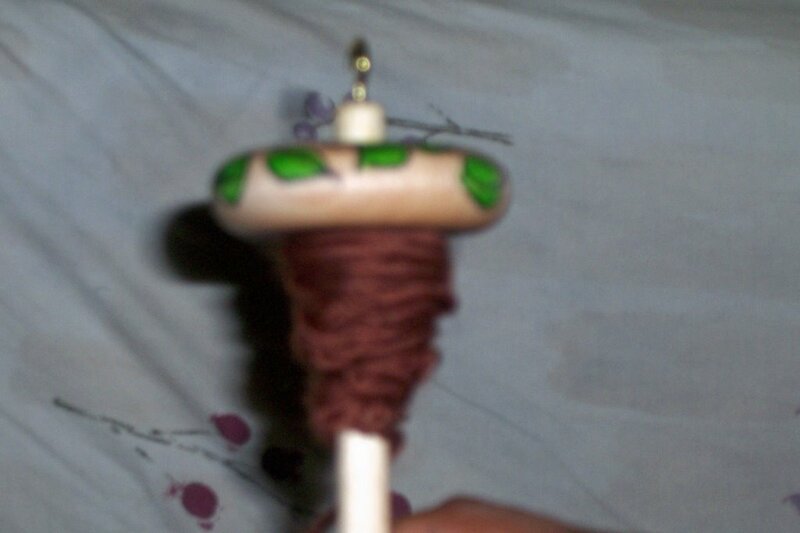 I was there for you when you got your first low whorl drop spindle and by golly I'm here for you now. Harry:Well, Marie. You remember a couple of days ago when I received 8 ounces of a Merino, Silk and Angelina roving special order from overseas? Marie: Just tell me Harry. Whatever it is we'll get through this. Harry: OK. I'll tell you. I was trying to navajo ply the singles I made with the roving. 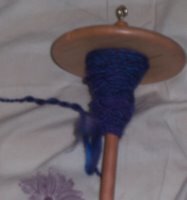 Because the roving was so delicate, I wanted to use a special spindle for it. So I borrowed your priceless Wooly Mammoth Tusk Spindle from the Journey Wheel. Harry: Marie, I'm so sorry. I know I should have asked first, but you were busy tending to the angora bunnies. Marie: That's no excuse. You should've asked. Oh well, I thought you had something worse that that to tell me. Harry: Well actually, while I was using it, I dropped it and it cracked. Marie, I'm sorry and I'll replace it as soon as I get enough money from all the hand dyed sock yarn I'm sell in my ebay store. 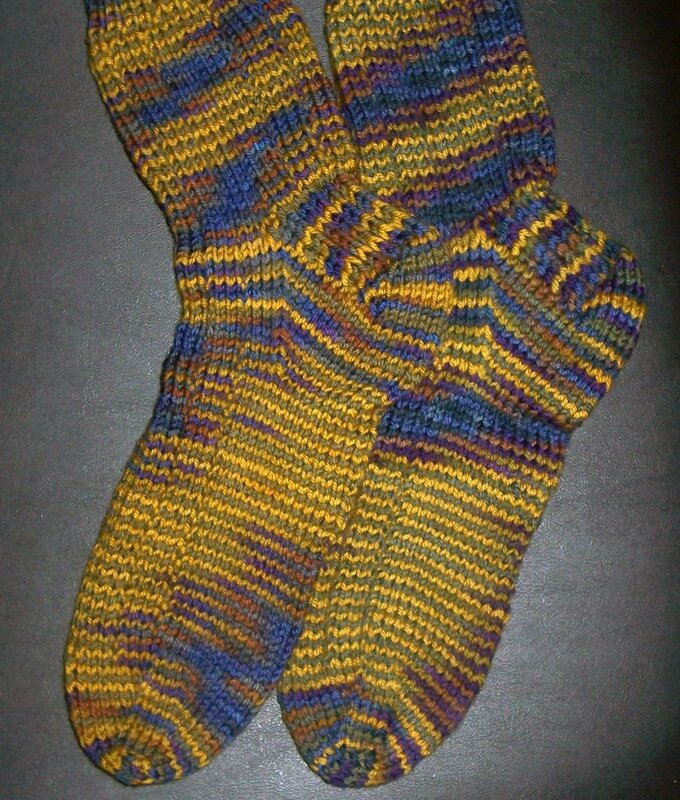 These are Ty's Thuja socks all done. I used Artyarns Supermerino in color 201. I swear this yarn is like butta! Luckily I had the yarn in my stash already. The colors in this picture don't do it justice at all. I also freeatyled a little change purse for his wifey Theresa. I think I may make one for myself. 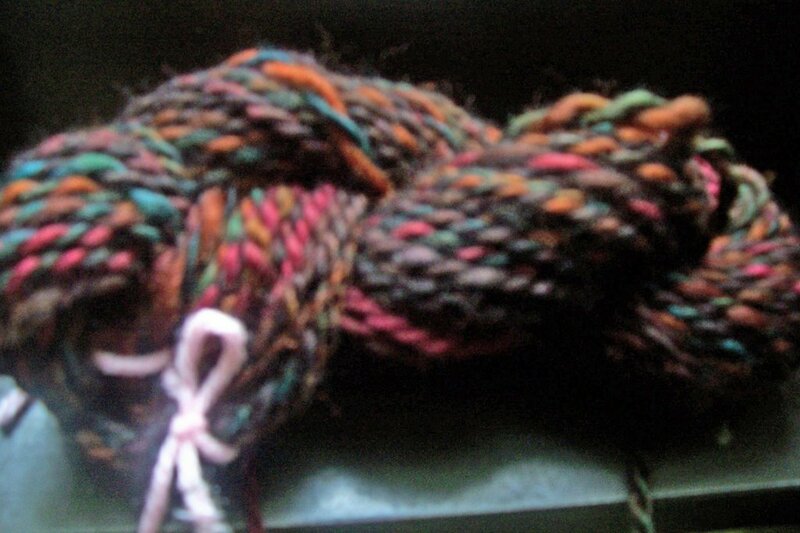 Here's teo versions of Handspun yarn that I spun on my trusty top whorl drop spindle. 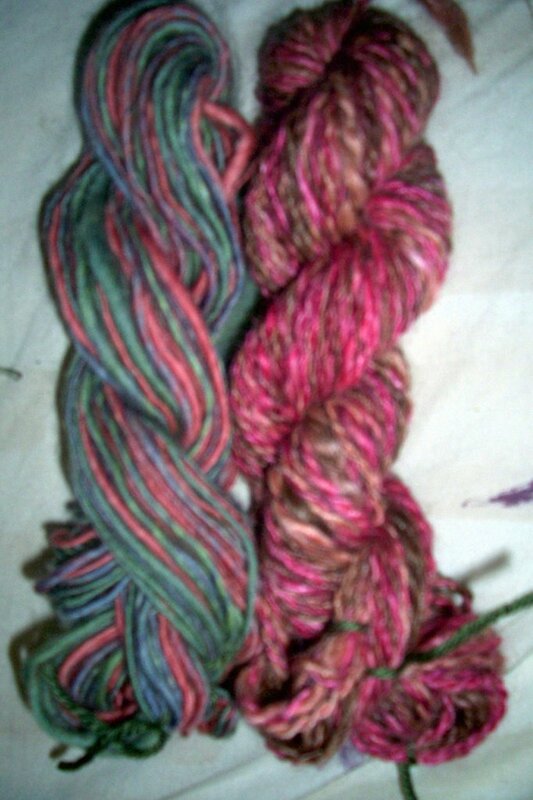 The one on the right I spun from roving that I purchased from the Yarn Tree. It's an Alpaca/Merino Wool/Tussah Silk blend fittingly called Chocolate Cherry. I was going to send it to my SSFP but it's only about 30 yards there and I don't think that's enough to make a sock with. The one on the left I actually dyed the roving myself using Jacquard Acid dye. I used three colors which were made by mixing different ratios of the primary colors. 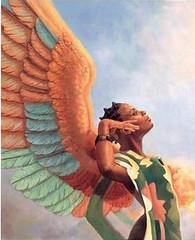 Of course the picture doesn't show it's true beauty. For anyone who cares, the chocolate cherry is two ply and the hand dyed is singles. 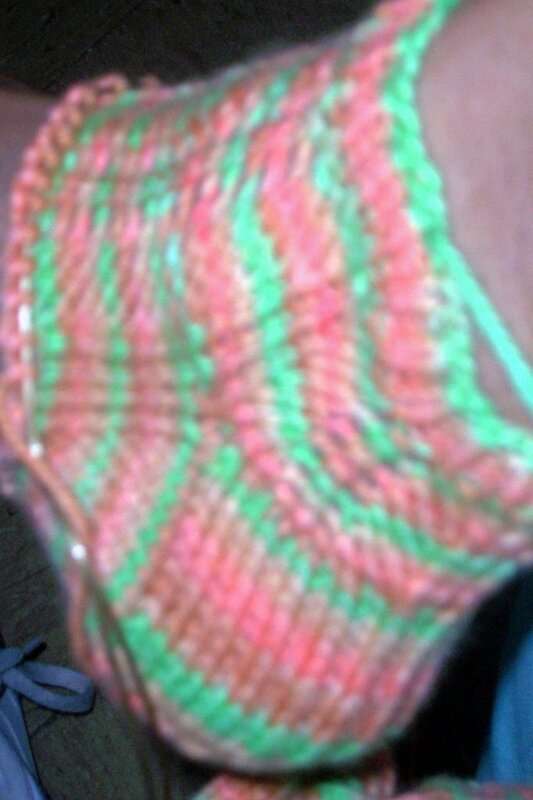 I'm itchin to knit a swatch to see how it comes out. 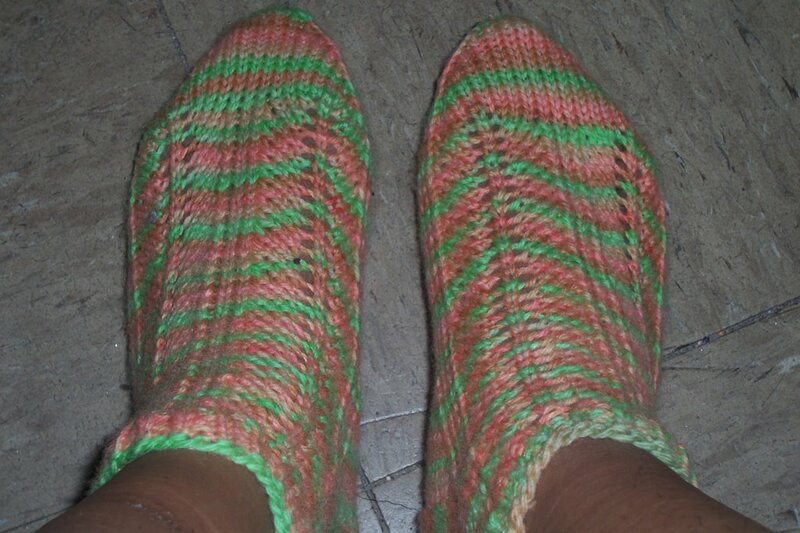 I'm working on a pair of ankle socks for myself just to keep my hands busy. This pic in progress is for Carine. I'm using the yarn that I dyed a while ago using Wilton's icing dye. 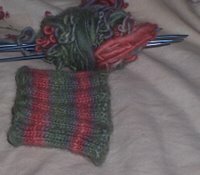 I wasn't crazy about the colors once it was all balled up, but now that I'm knitting with it, it's kinda growing on me. I just threw a lace pattern in there to break up the monotony. The pattern is on a multiple of 12 stitches and goes as followed: ssk, k3, yo, k1, yo, k3, k2tog, k1. I know this pattern must be in a stitch dictionary somewhere but I just thought it up while I was making my gauge swatch and thought it looked nice. I always save the best for last, so here's 8 ounces of yummy woolly goodness for your viewing pleasure.